Yard Envy, one of our sponsors here at Birding is Fun!, recently made me an offer I couldn’t refuse. If I was willing to post my own review of my choice of either one of two particular products they offered me to test, they would provide me with the product without charge, and at the end of the test I could keep the product. 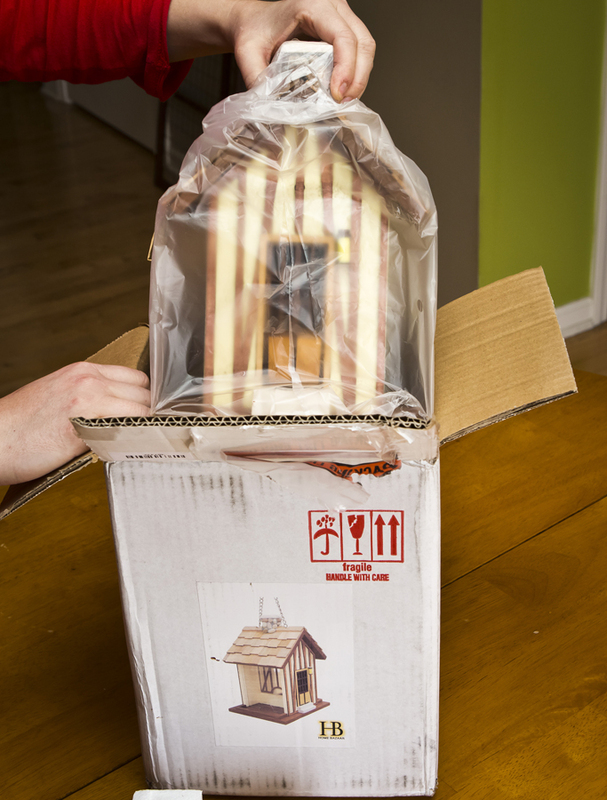 So this is my review of the Hamlet French Cottage Bird Feeder from Yard Envy. For the record, Yard Envy did not receive an advance copy of this post, nor did they have any suggestions or requirements as to the content of my review. They did provide me with the feeder at no charge. The feeder arrived well packed, in its sturdy shelf display box (i.e. not a plain brown shipping box). On opening the box and removing it, I was pleasantly surprised to see what appears to be a well made, quality feeder. The description on the Yard Envy website states it is poly resin, but that does not tell the whole story. It is attractively detailed with real rocks on the chimney, and real wood shingles on the roof. 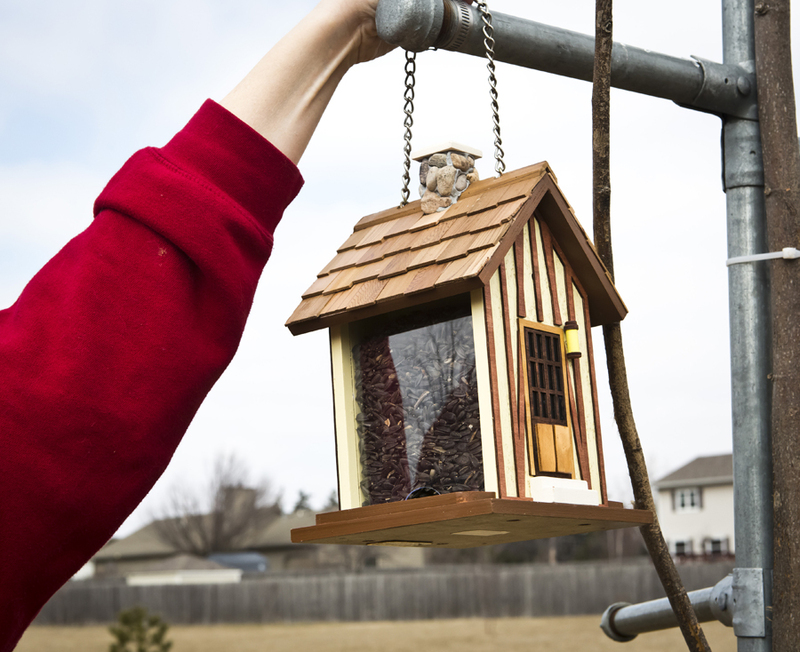 All in all, it is a very nice looking, decorative feeder. It came with a card showing the other products in this series as well as a cute story. It appears to be very well made, and seems like it should hold up in the widely varying weather conditions we have here in Wisconsin. So far it has certainly held up well through a week of absolutely torrential rain. Filling it with seed was very easy, just put the roof to the side (the hang chain keeps it from going too far, but it does stay out of the way) and pour the seed in the top. There are actually two seed chambers separated by a panel, so it is possible to put in two different kinds of seed if you wish. Seed capacity is not huge, but it is certainly acceptable, and that way the seed stays fresh which is very important. The seed is held in by clear panels, and can flow out the bottom through an opening onto the landing platform. After taking down my older feeder, we hung the Hamlet French Cottage Bird Feeder by its heavy duty chain. The backyarders took to the feeder quickly. 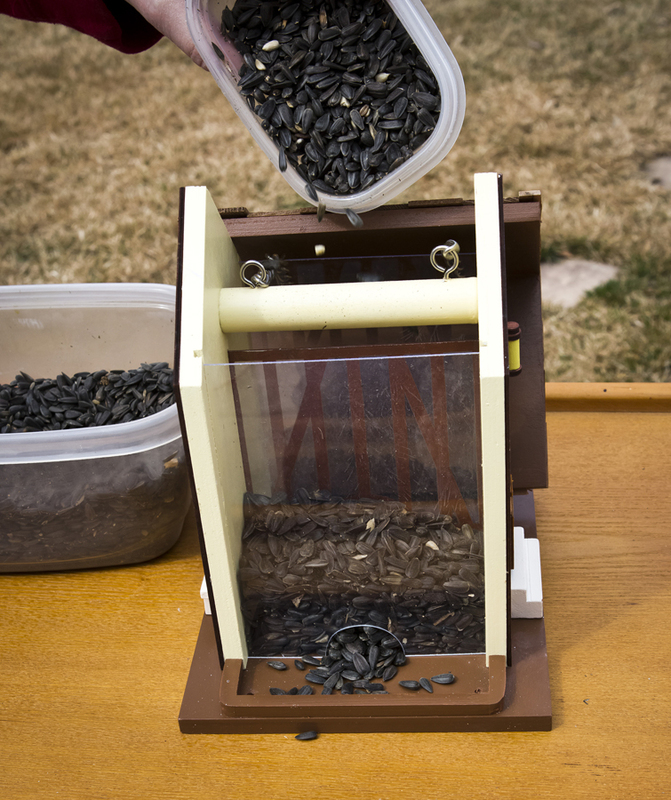 We added black sunflower seeds to the perch area so that the birds would see it and quickly start eating. Right away we got Finches, Sparrows and Red-belly Woodpeckers stopping in to try out the feeder. Now that it's Springtime it's going to be interesting to see all that will show up. 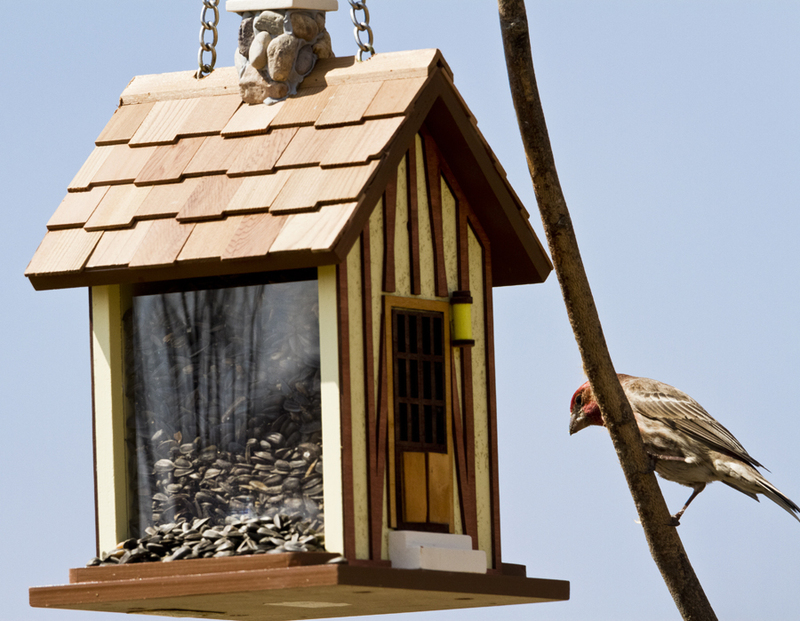 In summary, the Hamlet French Cottage Bird Feeder from Yard Envy is a nice product which our birds are very much enjoying. 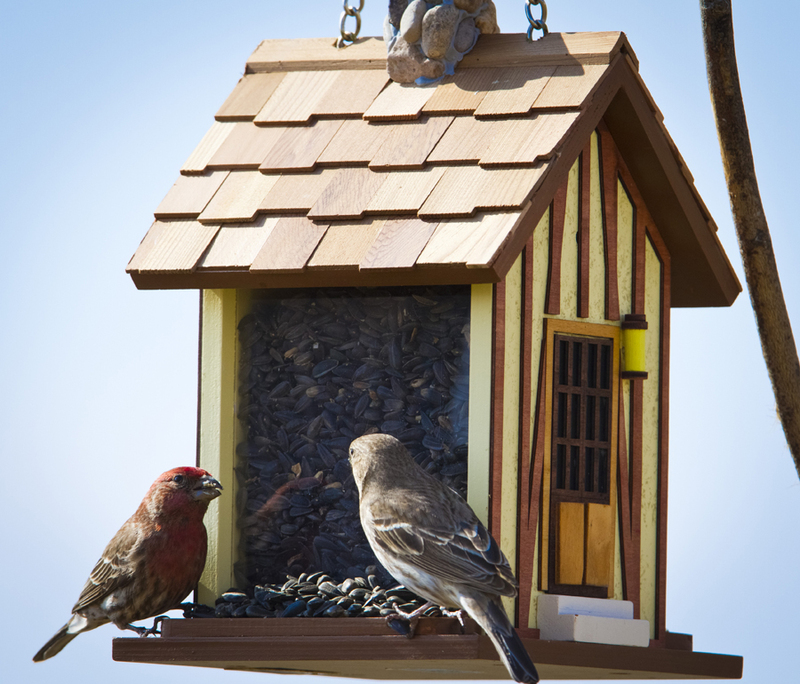 It would be especially great for someone who wants a truly functional feeder that is also highly decorative.